Cullen Witter must identify the body of Oslo, his teen cousin, who has just died of a drug overdose. The experience in the morgue leads Cullen to reflect on his life in Lily, Arkansas, a small town with pretty much nothing to recommend it except trees. He thinks of how the high school is divided into the usual cliques—preps, etc.—and of bullying and name calling. Cullen doesn’t cry over his cousin. In fact, whenever things are tough, he falls into fantasies; he wants to write a book about zombies. He sees everything that goes on in his town as part of his zombie apocalypse. When he focuses on reality, he wonders why he is so angry and rude to his father now that his dad has given up drinking. He contemplates Ada, the girl of his dreams. She’s known as the’ black widow’ because two of her boyfriends died in accidents within a year. Still—every guy in the school wants her. Cullen’s one good friend, Lucas, spends a lot of time at the Cullen house in order to avoid his own crazy family life. And he’s a friend well worth the trouble—wacky, funny, understanding. But the only person to truly rise above the small town life is Cullen’s brother, Gabriel. He’s thoughtful, kind, and very cool to have as a brother. Until he goes missing. No one has a clue about what could have happened to Gabriel. And as the weeks drag on, Cullen’s mom becomes depressed and checks out, eating meals in her bedroom, refusing to go to work. Cullen imagines all the things that his brother could be suffering in some kidnapper’s basement. And he is furious that the town is focused on a possible sighting of a supposedly extinct giant woodpecker rather than the missing Gabriel. 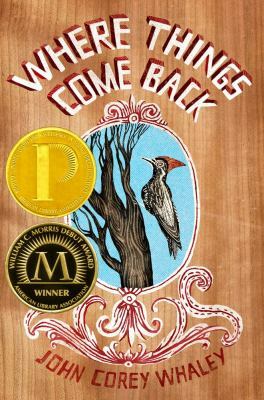 Where Things Come Back is, by turns, funny, poignant and mysterious. It’s a testament to faith and a window into religious zealotry and mental illness. There are two story lines that come together as the family waits for news of Gabriel, as their grief deepens and becomes very real to the reader. There’s a lot to love here. High school housekeeping: I think there is something for everyone in Where Things Come Back. If you are not used to reading or if you haven’t read a book with two separate storylines, be patient. It takes a while, but these come together nicely and will make you glad that you found out how they are related. This is very good writing and that’s always a bonus to a good plot line. Come check this one out! Author John Corey Whaley will be here in Ontario for the Teen Book Fest! If you enjoy his work, you can buy Where Things Come Back—or his new book (coming out today! ), Noggin—and have him sign it. Come on over to COHS for the Book Fest and say hello to your favorite authors. Call 909-395-2225 for more information. This entry was posted in Faith-Based/Religious Element, Family Problems, Fiction, Horror/Mystery/Suspense, Young Adult Literature and tagged Arkansas, book reviews, brothers, family problems, John Corey Whaley, kidnapping, religion, small towns, small towns in fiction, Where Things Come Back, YA fiction, YA literature, zealotry, zealots. Bookmark the permalink.